We are sitting today at the threshold of unprecedented growth. Everything in the world as we know it to be is up to be transformed and transcended. 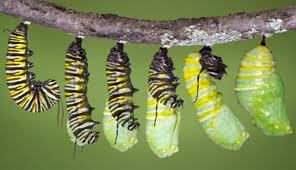 Collectively we have entered the chrysalis stage of human development. At this point anything is possible. As we surrender our selves to this stage of transformation we must release the fear of no longer being as we formerly knew our selves to be. All of our ego identifications and ideals that belonged to our caterpillar selves must be surrendered to the new greater whole…and this feels risky. In actuality though, the risk is minimal. There is no real risk in evolution. In evolution things simply, almost imperceptibly, move to the next step. We either try to delay the process of evolution by focusing on what was and continue to uphold those old ideas or we learn to release our ego attachments and set our sights forward to the unknown potential of what is to come. It becomes a matter of looking forward or looking backwards, or more precisely, of looking outwards compared to looking deeply inwards. We tend to equate unknown with dangerous but this is only a projection of fear. A very useful acronym for F.E.A.R is False. Experience. Appearing. Real. The experience is deemed false simply and truthfully because it hasn’t happened yet, so we actually project an outcome forward based on a negative past experience, which we assume makes it real because it happened a certain way in the past. Unfortunately, the error in the equation is that it doesn’t take into consideration all the awareness, skill and knowledge that has been learned between the old experience and the current time. All of these unacknowledged experiences have the power to create a completely new outcome. By laying the old expectation over the new possibility we create a future that mimics the patterns of the past – thereby ‘proving’ our fear to be valid. When we learn to view the future as a new adventure we get to co-create an entirely new possibility for ourselves. A new mantra to use in place of the old acronym is Forgive. Everything. As. Required. Using this mantra whenever we feel the old emotional F.E.A.R. grab hold of our bodies and minds will serve to ‘re-mind’ us to leave the past in the past, forgive unconditionally what ever it is in us that wants to hold on to the past, and prompt us to let go without attachment for our highest good. Through forgiveness we may gratefully acknowledge the small part of us that is unsure, and yet in the same breath we can energize the visionary part of us that wants to move boldly forward toward the unknown. In co-creation we solicit the assistance of the Divine Creative, the one with the plan. And I don’t mean the one being – I mean the one consciousness of which we are all part. In One consciousness we move into our perfect placement in the holistic holographic blueprint for humanity’s ever evolving nature. In Oneness, I simply do my part while everyone does his/her part. Ego and self-righteousness disappears in the perfection of the whole dynamic. While this is certainly happening already to a degree, the overall plan is currently reflecting distortions caused by individual attachments, control issues and fears. Through surrender to our mutual perfection we allow minute variations to occur which more accurately tune us into the right place, right time scenarios. The trick lies in being able to recognize the pivotal synergistic opportunities without projecting egotistical needs over top. 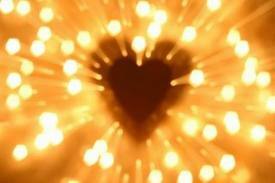 To establish this clarity of intuition vs ego we need to make friends with our hearts. Love offers us the opposite vibration to fear. The heart pulses out a frequency that is connected to and resonates with the sacred pulse of the universe and our earth. The Base Resonant frequency of Earth is our touchstone of reality that serves to keep us entrained in the harmonious working of all things great and small within our Universe. By releasing our minds from fear we are able to ‘keep up to speed’ with the quickening vibrational frequency of the Sacred Circuit of Universe>Earth>Heart>Cells. As our bodies are creating new cells by the second we allow our cellular construction to be built-in harmony with all that is; in new progressive programming instead of the old worn out tired and dis-eased programming of the past. So here we sit, looking forward to a new day, or fearing the collapse of the old day. Truly this is a very apt comparison. We sit in the in between time between dark and light, we are in the dusk/dawn time of a new era. One era day is ending while a new one is simultaneously beginning. Trying to hold on to yesterday won’t help us and in fact puts us in a very surreal place of non-relevance. By keeping our attention on a day that has passed we cease being able to put our energies where they can be of assistance to the transition ahead. We lock ourselves into repetitive patterns, gradually becoming less and less effective; more and more jammed up, less and less able to hold the light of the new frequencies of the new era being birthed. We are by nature visionary, and if you have been paying attention to your heart – even in the slightest, you’ll have noticed that in recent months you have been feeling somewhat dissatisfied (if not greatly frustrated) to be doing the same old same old. You are yearning for a new expression. Deep inside you are feeling the push/pull of something truly great wanting to come forward from within. A sacred resonance is being activated and you are at this point in the transformation only half-heartedly listening to your truth calling you forward. Your body, however, is desperately wanting to heed the insistent whisperings. By attuning all of your attention to your heart you will begin to hear the transmissions of universal energy clearer and clearer. 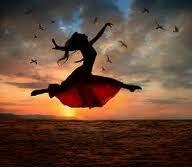 You will begin to move your body to dance with the rhythms of the universe. You will automatically be able to step into the right place and right timing to fill the position that is perfect. It may feel like a leap of faith when in truth it is only a step in the dance; the dance of your own creation for the highest good of all. Sometimes Universe turns us down mysterious pathways just when we need it most. Thanks for leaving a comment! Hope you find your way back here again!